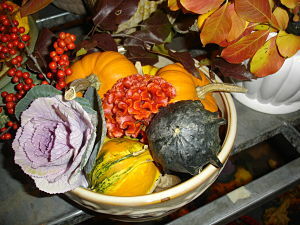 A fall-themed centerpiece used gourds. This could also work as simple decor in other parts of the auction. A group recently asked me about fundraising auction ideas they might use that would incorporate vegetables. They have a food-focused nonprofit, so the idea of talking about vegetables in a conversation isn’t oh-so-odd. Using vegetables in your auction isn’t a crazy idea; there are actually many ways you CAN use them. In this podcast, we look at some areas of your auction — decor, raffles, selling them, visual displays — and how to include them. The not-so-lowly, rich-in-antioxidant vegetable is finding a niche in fundraising. Click to listen to the podcast below.